Weren’t you just here last month??? 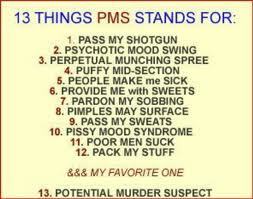 I thought I would Google “PMS” images this fine morning. I came across this one that took the BSC out of my head simply because of the extremes I can be inflicted with. Lately, since I upped my fitness program to a higher intensity, I must say I have less symptoms of the dreaded shark week. However, the sensitivity part is in full swing. I emailed the Captain both of these images along with a personal message asking if my temperament is good with him though? I am nervously awaiting his response. That sensitivity button is pushed and stuck in the on position with no end in sight. That’s just my reality for the moment. As my grandma and likely her mother so eloquently deemed it, “the curse” I have always been able to relate to that term. ‘Curse’-defined: noun ‘A solemn utterance intended to invoke a supernatural power to inflict harm or punishment on someone or something’ hmmm what a horrific analogy. 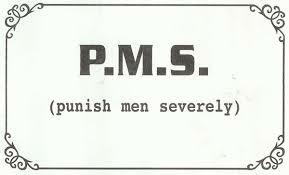 When I read this one I honestly did not see the ‘n’ in men. Subliminal perhaps? Rant over…till next month. Until then, happy shark hunting!